We'd like to share with you a recent road trip one of our customers, Celius experienced. Celius spent 5 days travelling through Vancouver Island and loved it so much she decided to document their travels. Here is the original article, although it is written in Spanish so we decided to translate it for you below, enjoy! We arrived in Vancouver after 5 hours on the plane that took us from Toronto to the West Coast of the country (it seems incredible that in the same country you need five hours of travel from coast to coast and that there is a time difference of three hours). After spending the night sleeping in the airport, it was time to receive our new rental car which was going to serve as a bed, kitchen and dining room. We wanted something that would allow us to sleep and sit at a table if the weather was rainy. After many days searching the Internet I found a Dodge Grand Caravan at a reasonable price (even at a better price than the one we rented in the low season in Iceland). We opted for a small company in the city ​​of Whistler: Roam Free Campers . We have had a very good experience with them. The car had everything we needed to cook, eat and sleep. We paid the extra for unlimited kilometers and were able to drive to Yukon with her. The contact by email, phone or whatsapp was fast and Rory was nice, he helped us with our never ending questions. Day 1: Ferry from Tsawwassen to Victoria. Visit to City. Night at Cowichan Bay. Day 2: Visit to Cowichan Bay, Duncan, Chemainus and Cumberland. Night at the gates of Strathcona Provincial Park. Day 3: Trekking in the Strathcona Provincial Park. Night in Sayward. Day 4: From Sayward to the Marble River Provincial Park making stops at Schoen Lake Provincial Park and the city of Port McNeill. 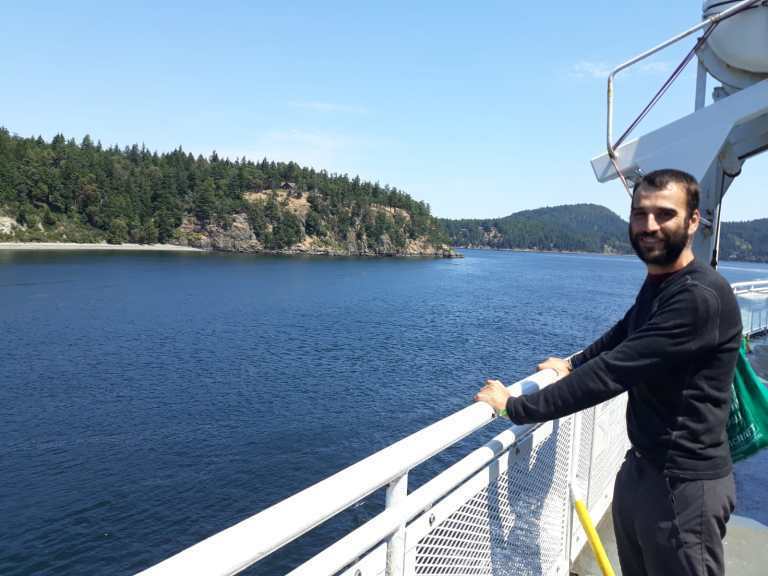 Day 5: Ferry from Port Hardy to Prince Rupert. 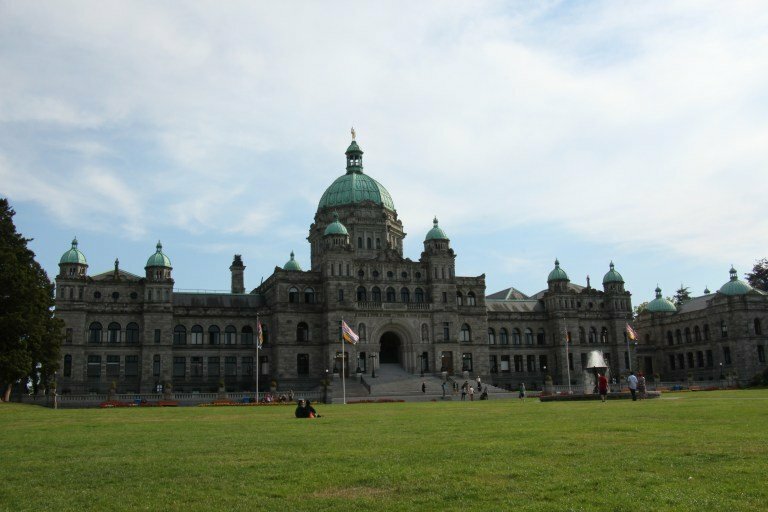 After the trip from the Airport to Victoria we arrived at the capital of BC at 5 o'clock in the afternoon. We parked the car in Chinatown and went to explore this beautiful city. We arrived too late to see any museum or make the free visit to Parliament, although we were compensated by walking from one end of the city to the other. We walked from Chinatown, through the parliament building, to the beginning of Douglas St where the Trans-Canada Highway 1 that leads from one end to another country, from Victoria to St. John's in Newfoundland. The city is small, it can be done in about three hours as we did, or stay at night to see the illuminated Parliament building or to do a little bit of shopping. I recommend going to Munro's Books, where we fell (more) in love with books and bookstores. If you want to go running there is a series of parks along the shore south of the city that take you parallel to the sea and the elements. Or you can just walk for the sheer pleasure of enjoying the views of the mountains of Washington State and the sea. 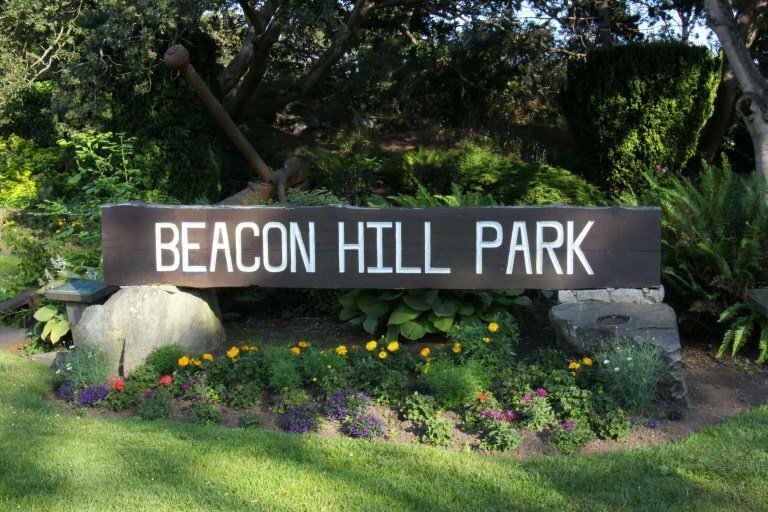 It is also worth walking through the beautiful Beacon Hill Park, where meandering paths take you through the park through large trees, lakes full of ducks and beautiful flowers. 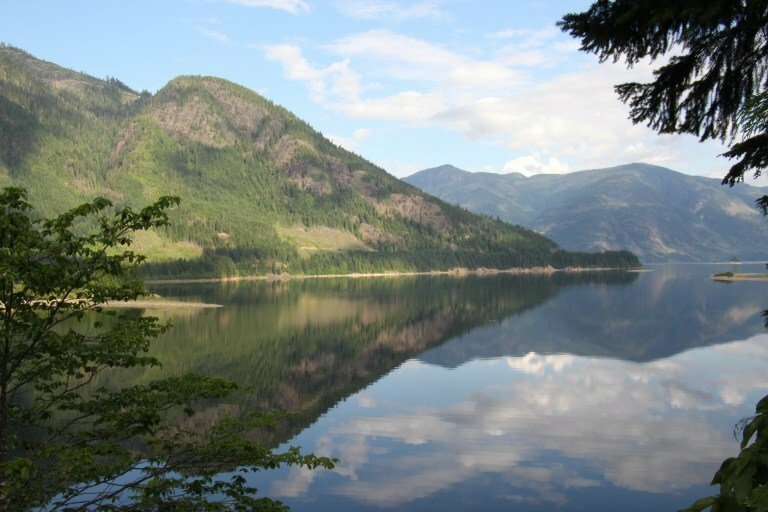 Going north we pass through several towns until we reach one of BC's many provincial parks. 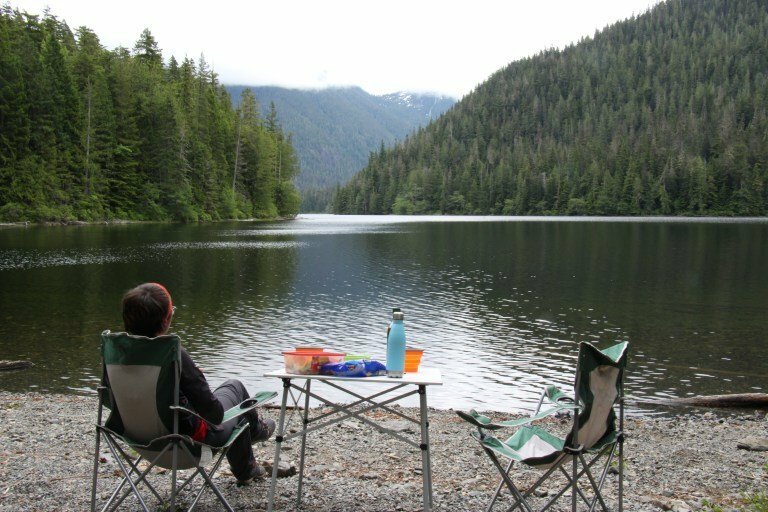 In the Lonely Planet guide we have a map of the island where we can see a few provincial parks, but there are more on the island and throughout BC. It may be advisable to buy a book with maps of BC where all the roads and parks appear. We bought a small book at Saples before arriving at Tsawwassen (between Dollarama and Walmart) and it cost us 10 dollars. It is a small and quite manageable guide that we can have stored in the glove compartment. The publisher is MapArt.com. 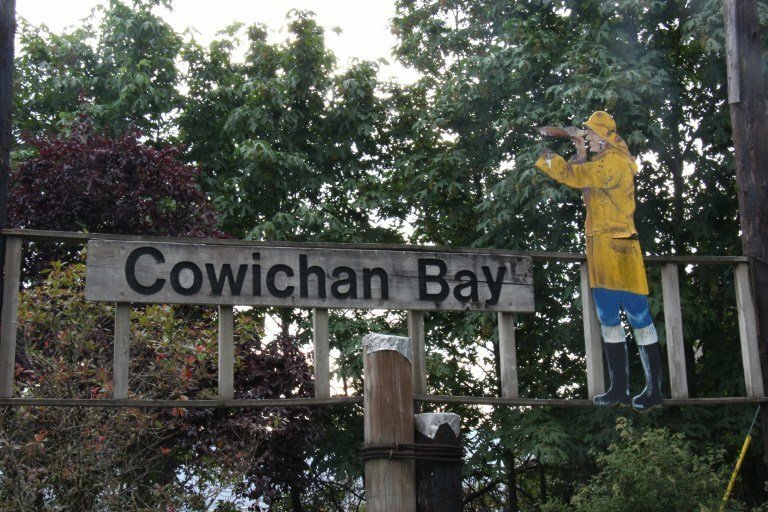 Our next stop was Cowichan Bay. The village of Cowichan Bay is a small street that runs parallel to the sea with several restaurants, hotels, sleeping houses and even a cafeteria (True Grain, open at least 8 in the morning) that we use as a bathroom the next day at the cost of two coffees and two buns, which were quite rich. Leaving the town we have a parking area and a small park in which is specified that you can not sleep, but a few meters ahead you have a nice place to spend the night and even engage in conversation with the locals. Duncan Village is famous for its dozens of totem trees scattered along the main streets. We can park the car for 2 or 3 hours in any of its streets or car parks and follow the yellow footprints that are stopping us in each of the totems that decorate the village. They are very pretty, with black, red or yellow colors, bright colors that give them the ferocity of the bears, whales or birds that decorate these tall sticks. In front of each work we have an explanation with the meaning of the animals, the legend to which they refer and the story behind the artist. 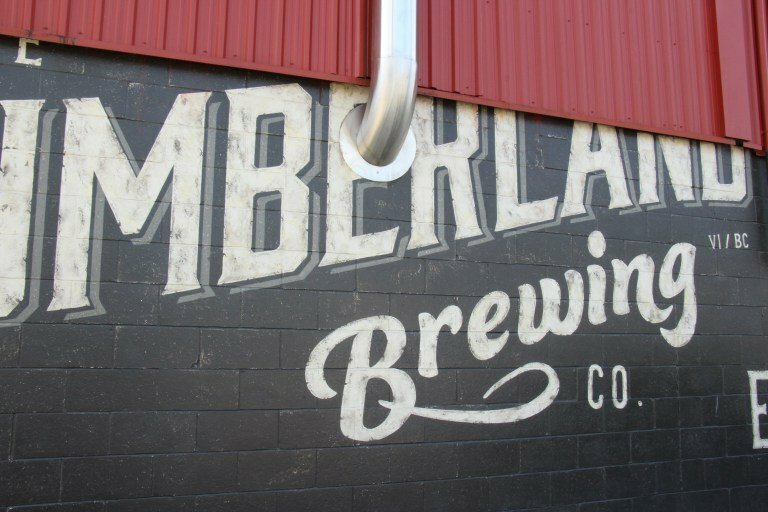 If we want to enjoy a little more of the art we can take a walk through the old part of Chemainus, where we will enjoy the murals that the locals have painted on the walls to give color to this town. Its a Quick walk that we complete with a stop at a small beach at the end of the town. Of all the cities we have seen on this island, this is the one I liked the most. It is a small town and in which is easy to walk. It has a bohemian and hippie air that seduced me. We could only spend a few minutes here, but it would be a good stop for the afternoon, enjoying its vintage shops, its brewery and sleeping in your hostel. Along with Comox and Courtney, this city is within the Comox Valley. This is a Big city in which it may only be worthwhile to stop to make a purchase and notify family and friends of future travel plans.There are only a few cities we will find until Port Hardy and this city has little to offer, just the ferry. Although from here we will see less cars, towns and life in general, there are gas stations and options for supermarket and internet in Port McNeill. In this town there are several coffee shops, banks and a large supermarket or a place to use the Internet. There are more cities : Nanaimo, the second largest city on the island; Courtenay, in the Comox Valley and others indicated by the guide, but having the limited time we had, we had to choose. 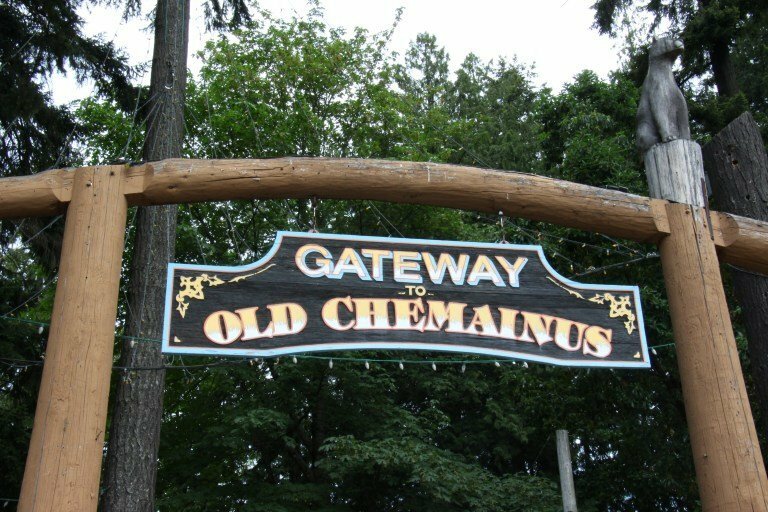 In any case the provincial parks are sooooo nicer than the cities, although Duncan's totem poles or the murals in Chemainus are pretty to see. From Campbell River we take the road to the park and the city of Gold River, a road that will not be gravel, like the roads that go to other parks, although it will border several lakes that will make us go slow and spend a couple of hours on its tracks. At the gates of the park we decided to spend the night looking for a place somewhat away from the road that would protect us from the eyes of others and because we had seen a sign that prohibited sleeping less than a kilometer from the road. Inside the park we have a Campground, although we stayed in a place overlooking a lake that offered us a beautiful violet sunset and the solitude we were looking for. This small site is marked by an abandoned old caravan. And it is here, looking at the Upper Campbell Lake, bathing in its cold and lonely waters after a long trek between pine trees and ending in a glacial lake, where I saw reflected in it the Canada I had in mind. The Canada of blue lakes and green forests, lakes of pure waters and endless vegetation. Note on the Provincial Parks: at the entrance to the park we have an information post, but not the one with a small house and an employee who offered us a map and explanations about the park's routes. These provincial parks are free entry , not like the provincial ones in Ontario or the Canadian Nationals where you have to pay a fee of about $ 10 a day. That is why we will have fewer services throughout the park: less information about the routes, although a few have been explained, fewer toilets although the ones that were available were quite clean. In the guide we had four marked routes of which I could find only two on a map that we saw in the information post at the park entrance. It was in this position where we stopped for breakfast with great views of Upper Campbell Lake and good bathrooms. We decided to go to the south of the lake on one of the longest routes, but we changed our mind and went to one of the last marked routes of the park: "Phillips Ridge Trail" , 6 kilometers and with an elevation of 800 meters that took us to the glacial lake of Arnica Lake , with hyper-frozen waters, snow and tall trees. It was a difficult route that took us 3 hours to climb, with a climb without rest, but comforting when you were at the top. There is a campsite on the other side of the lake, which we did not reach. To get there, you have to cross the river that forms the lake to lower its waters, and its waters are frozen! Nice views and cold feeling our first contact with a glacier lake. Crossing the lake to walk a little more. The water came from the snow and it was sooo cold. It was a nice trekking, we started at 11 in the morning and finished at 5 in the afternoon. It's a few kilometers, but a good climb, it is advisable to bring food and drink. We did not take any more than peanuts to peck and we enjoyed a meal in the car park of the Karst Creek route . We did not want the day to end in this beautiful park, and taking advantage of the sun, we bathed in the Upper Campbell Lake and dried in the sun. 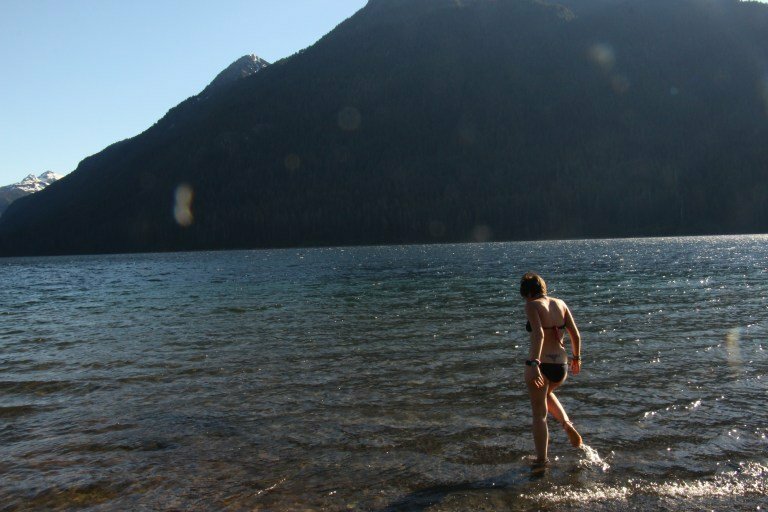 There was no one at 7 o'clock in the evening in this huge lake so we enjoyed it as long as its cold waters let us and we dried in the sun, without needing a towel. Campground . They are paid and have a variable rate. It is advisable to carry loose change since some cost $17,40, another $12, other $13 and even $21.5 ch we have seen. Always having 10 and 5 dollar bills as well as many coins is a good idea so you do not have to overpay if you do not have change. There is one in the Strathcona Provincial Park which we entered, but in which we did not spend the night. They have bathrooms, drinking water (not all have potable water, in some they advise boiling water and others do not have it directly) and they are paid by an envelope in which you deposit the money. In the case of this campground I think there are employees who are going through the different camping areas to check camping passes. In "Sayward Village Campground" there are 6 camping spot that cost $18 dollars without service or $25 with service, understood as electricity service and wastewater outlet. You can use the public bathroom and there is drinking water. The maximum stay in these types of campsites is usually 14 nights. NOTE: this type of accommodation is "the first one that arrives" takes a place. In the ​​the rockies at the beginning of July, that is, high season, everything was quite full so we were forced to go to the campsite to take a place before any trekking or days activities. Recreation Site. So far we have only visited the Marble River Provincial Park, but we believe they are free. They have bathrooms, but unlike the campground there is no garbage service, so we have to take the garbage with us. The aforementioned has 16 spots with a bench and picnic area in each square. At the end of June, it had hardly any guests and it was clean. NOTE: throughout BC there are many Recreation Site for sleeping that are free and have the services described above. There are some costs, as in the case of the city of Whistler, but, in general, all are free and can not be reserved. It is only 10 kilometers away from the main road and it has a petrol station that closes at 22 o'clock at the junction. Beautiful Lake Schoen to spend a night and contemplate the mirror reflection of its waters with the mountains, if you arrive on a clear day. If not, it is a nice stop to eat in front of the lake and rest. The road is bad, but it can take us to the Cain mountain of 1804 meters to ski in winter or to Schoen lake . We went to the west of the lake where there is a Campground (I think it's free, but we saw some old payment envelopes) with some camping spots in which to spend the night and a small stone beach access to the lake in which Enjoy food or coffee. At the other end of the lake we have a trekking road that you have to reach by car on Highway 19 or by canoe, like a good Canadian. We could not do the route because we did not know how to get there, so we were content to eat with a view, even if we had a somewhat leaden sky. This park we loved, to be able to enjoy it you can arrive on a summer day around 7 in the evening for dinner and sleep. As luck would happen we managed to see some black bears. Faced with the prospect of not having any supermarket in Port Hardy, as a couple we saw at Lake Schoen told us, we decided to try our luck in the town of Port McNeill. In Port McNeill we took the ferry to Alert Bay for a day trip to do some shopping in the town, have a coffee and surf on the Internet. It has a large supermarket, the IGA, slightly overblown prices, banks (like the CIBC) and coffee shops with Wi-Fi (like Mugz). Regarding the ferry trip to Alert Bay I have no information, although it was an idea for our last day on the island. Wild park with grunts of bears (I promise that I heard the bears and was not influenced by the warning sign in the park) in which you can sleep in your Recreation Site for free . It has 16 places between the trees to sleep. In each one there is a fireplace to cook and a bench to eat.. The campsites are between raspberries and tall and leafy trees. Each spot is hidden from curious neighbors. There are clean toilets with toilet paper. As seeing its a free camping area they do not have cleaning service, so we have to take our garbage with us. A few meters from the Recreation Site we have a hiking route. This route is among huge trees in which you think you see Barbol, Lord of the Rings. It's beautiful, but ... we listen to bear grunts! And I turned around running. In the following photos you can see some details of the first meters of the route and the wild trees that populate it. The Ferry took 16 hours. It left at 7.30 in the morning. Taking the cheapest fare, that is, without stateroom, the ticket for a small car and two passengers was more than $ 700. Even though the ferry is 16 hours the trip did not feel too long. There is a cafeteria to eat, a room with televisions where we put on a movie and the World Cup matches, chairs to rest, a barbecue on the terrace outside and chairs on the outdoor terraces to see the nice view as we travelled between the islands. During the crossing we were allowed to go down to the cars twice . Once the boat goes out to sea, it is forbidden to go down to the car. Having had previous experience in other ferries we took a lot of food, books and all the electronics that we had to use the plugs of the ship and charge mobiles, cameras and computers. What we did not expect and liked was the 15 minutes in which they let you go to the car to pick up or drop things off. We still had a long way to go, a lot of British Columbia to discover, but we had not started on the wrong foot. We would have stayed one more day visiting the Cape Scott Provinvial Park or visiting the cities of Ucluetet or Tofino, but we had reserved the ticket to Prince Rupert and we had to leave the island.